Having completed my powerful red laser about two years ago, I decided that it was time to increase my laser collection and begin work on another laser. 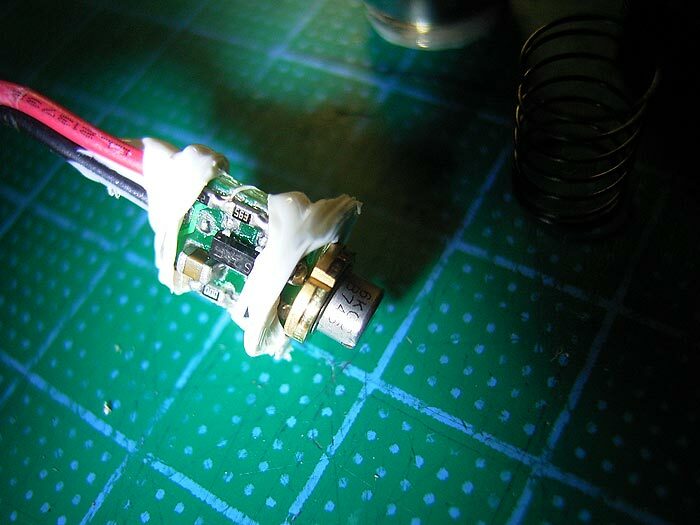 Now the red laser project was only possible due to the production of cheap DVD burner drives, from which I could extract the powerful laser diode. 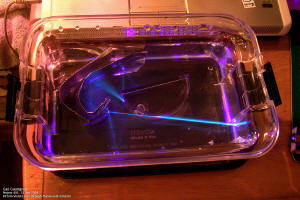 DVDs use a 650nm laser to read/write DVDs. In early 2006, a new high-definition format was finalized - the Blu-ray Disc (BD). Now the difference of BD from DVD or CD was that it uses a blue laser (actually violet) to read and write on this new optical storage disc. 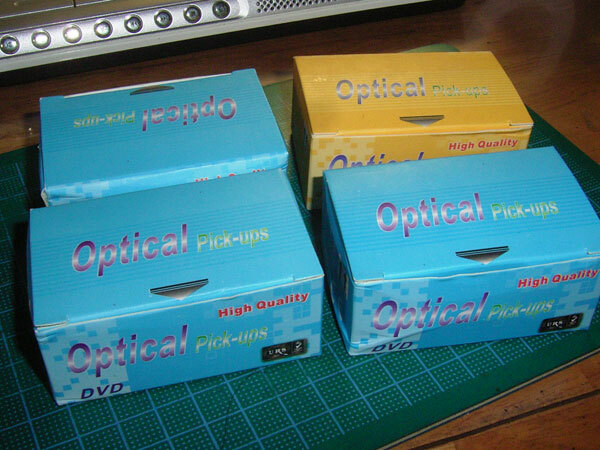 The first BD players started shipping in mid 2006, though it faced competition from HD-DVD (which also uses the same violet laser). BD eventually won (in Feb 2008), leaving it as the sole victor and ending the format war between BD and HD-DVD. 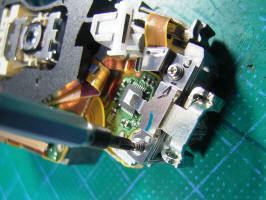 The part that is relevant to this project is the violet laser diode which is inside all BD drives. 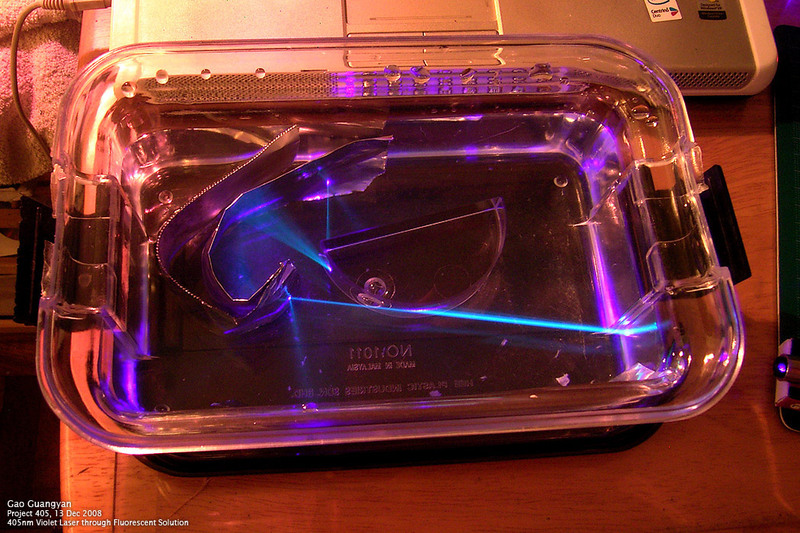 Up till the mid 1990s, the only way to get a blue or violet laser was to use large and expensive gas-lasers requiring large amounts of power and strong cooling systems. Hence blue/violet lasers were much sought after. 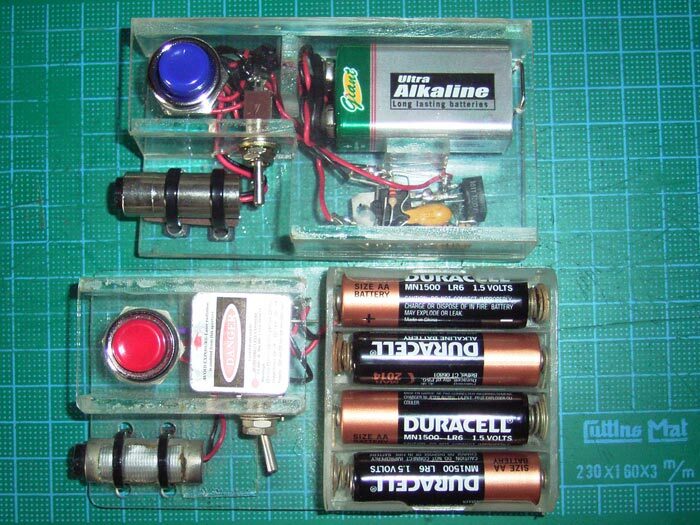 Only recently did technology allowed the creation of small and relatively inexpensive blue/violet laser diodes. So obviously I had to get one! The only barrier stopping me was the cost. The most logical place to find this violet laser would be in any BD player, and I discovered that the Sony Playstation 3 had such a drive. 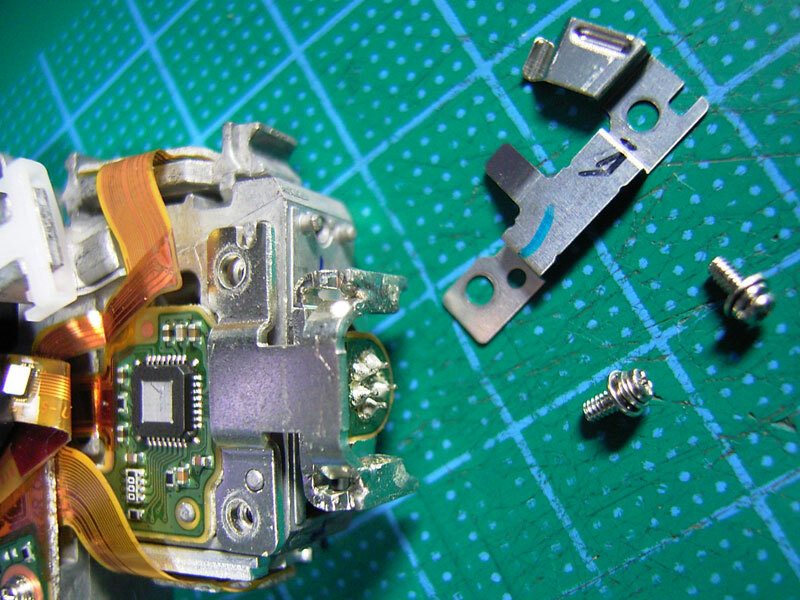 Back in 2007, it was still reasonably expensive to buy one such PS3 laser module online (roughly in the range of USD$80). So I waited. 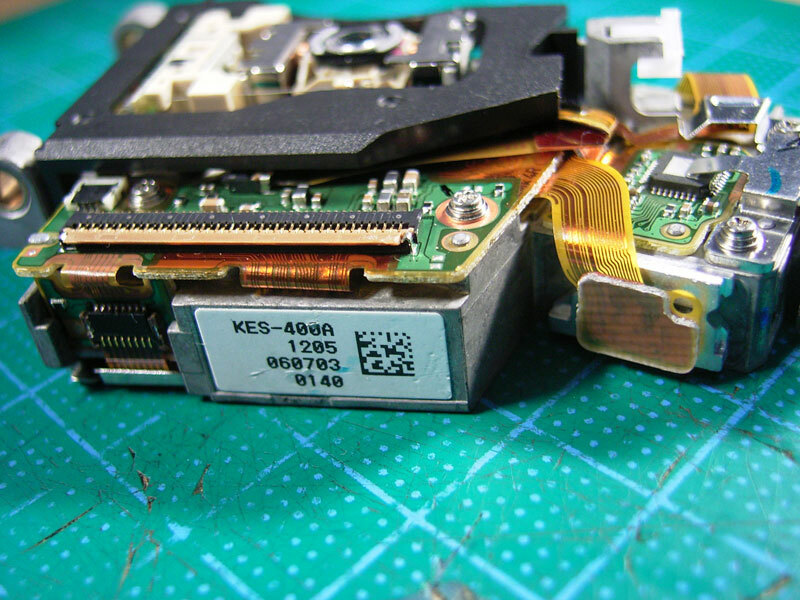 Now in the closing of 2008, I managed to strike a deal of a brand-new PS3 laser module sled (complete with optics, with model number KES400A) for a relatively low price of $50SGD (eqv. to about USD$33)*, marking the birth of this little project! Shortly after building the simple driver circuit for my KES400A laser, an accident caused Catastrophic Optical Damage of the KES400A laser diode, rendering useless. 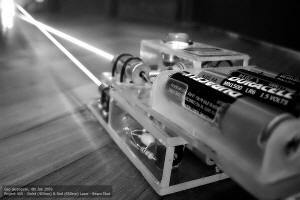 Fortunately, I simultaneously discovered a source for extremely affordable PHR803T laser sleds. 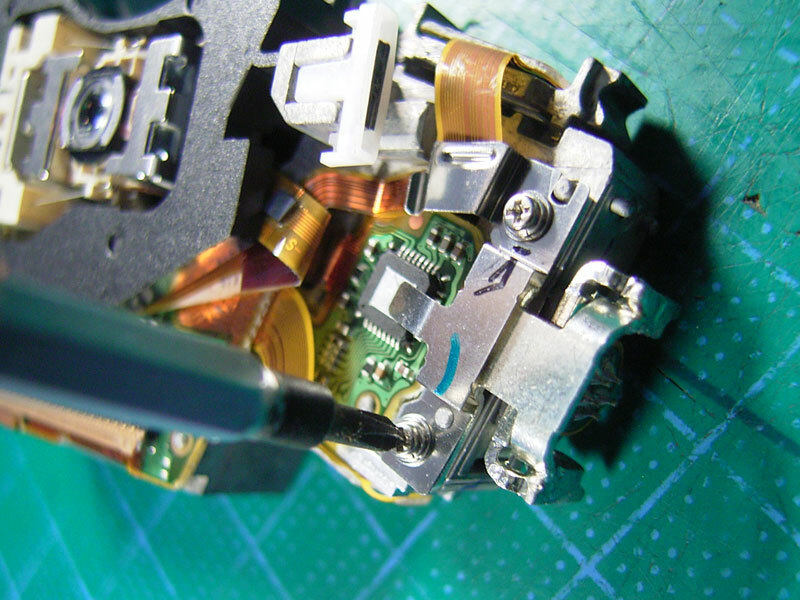 These sleds are used in the Microsoft X-Box, and similar to the PS3's BD reading capabilities, contain a violet diode (in this case, used to read HD-DVDs). Unlike the KES400A, whose violet diode is packaged in the same diode package as the red and IR laser diodes, the PHR803t contains 2 separate diodes - one red/IR, and one purely violet. The good news is while the KES400A violet diode is known to be pushed to 20mW-30mW output max, the PHR803t has been known to operate quite happily up to 100mW! Given the low price, I bought some of them. By New Year's Day 2009, they had arrived to my house. Perfect opportunity to revive Project 405, and an exciting way to begin the new year. 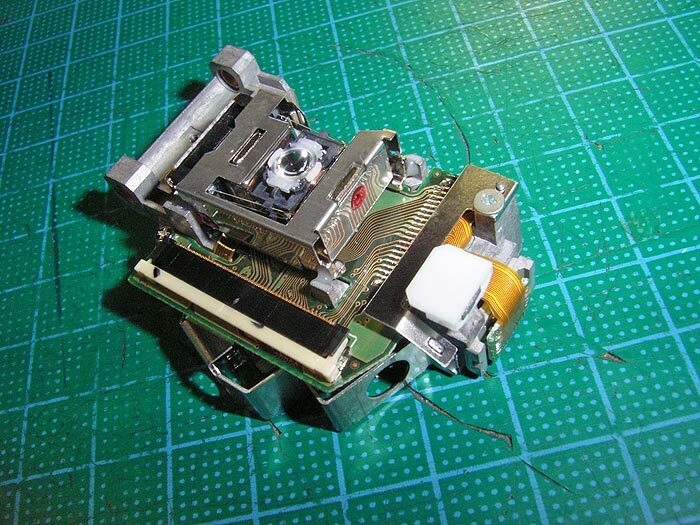 This page layout has thus been reformatted, with latest news and photographs below the introduction, followed by details and optical characteristics of violet laser diodes, the KES400A diode, and finally the PHR803t diode. To determine threshold current (if you have suitable equipment), hook up your laser diode to a controllable current source starting from 0mA and slowly turning it up. Even at low currents (as low as 1mA), some violet light can be seen. This is not lasing and should appear quite violet (in a diffuse circle) on a white piece of paper. 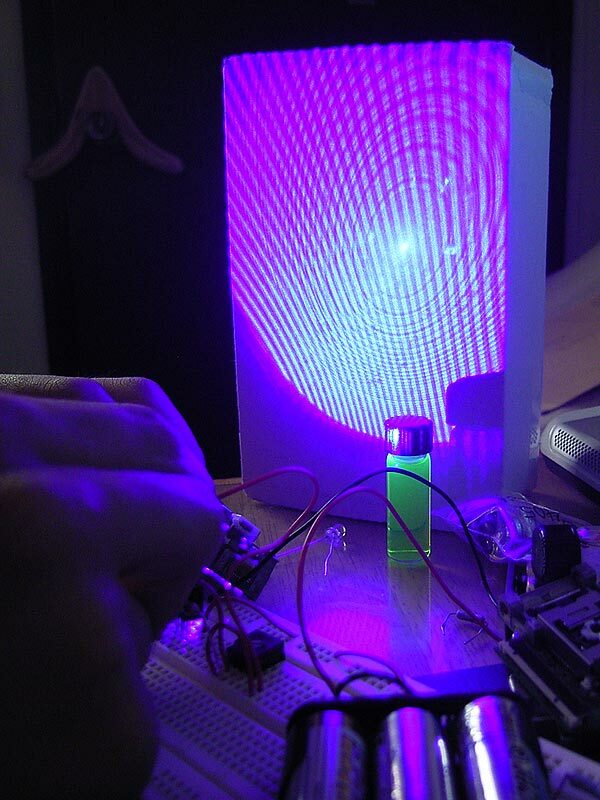 Turning up the current slowly, observe the output and at threshold, the violet circle should turn into a dim blue oval (blue because the paper will fluoresce) with visible speckle. Record this threshold current. While the output (mW) increases generally linearly with the input current (mA), remember that driving it at higher power reduces the lifespan of the diode, and a bit too high results in a very expensive (and dim) LED, especially when Catastrophic Optical Damage (COD) occurs. When that occurs, optical output drops significantly at the same input power; beam symmetry would change, produce side lobes and spots, banding, etc..
Having had some experience driving the much more powerful 200mW red laser diode (previous project), and with the data gathered above, I was then able to proceed in creating a simple current regulating circuit to drive my violet laser. 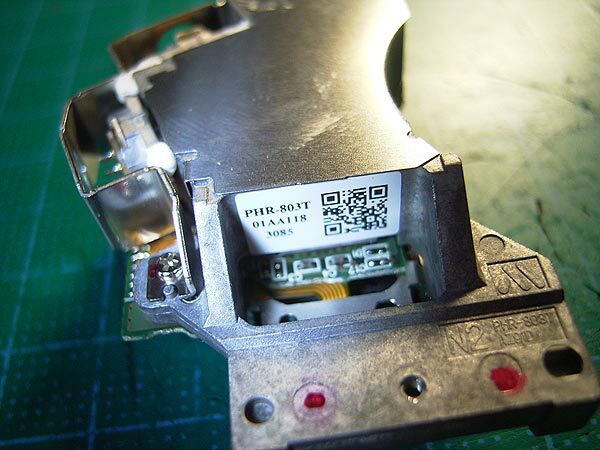 Similar to the diode in the Sony PS3 laser sled, the actual laser diode used in the X-Box PHR803T is unknown, and it is equally sensitive to ESD and current. However, the PHR803t has some very interesting characteristics which makes it more appealing than the KES400A. Of most significance is that it appears to be able to handle a much greater current, in the order of 100mA for stable operation, outputting ~80+mW at that power. was my most powerful specimen. Further analysis of the data (still in progress) reveals that even the diode with the blue line might go as high as 185mA." How bright should this laser look appear to our eyes? The following table lists the relative sensitivity of the Mark-I eyeball to wavelengths (including common laser sources) of light throughout the visible spectrum and somewhat beyond. Of course, not everyone comes equally equipped. Your mileage may vary (and the number of significant figures in some of these entries should not be taken too seriously)! Note: In the table below, the entry under 'Color' attempts to describe the actual appearance while the color listed under 'Typical Source/Application' is what you are likely to see in a laser catalog. 410 nm    .0074     "                  "
640 nm    .175      "                 "
645 nm    .138      "                 "
660 nm    .061      "                 "
This is according to the 1988 C.I.E. Photopic Luminous Efficiency Function. A plot of these data may be found in Response of Human Eye Versus Wavelength. The C.I.E. (Committee Internationale d'Eclairage) may also be known by other initials indicating the English translation (ICI for "International Commission on Illumination"). A variety of information on color perception including many charts, tables, references, and links, can be found at the Color and Vision Research Laboratories of the University of California, San Diego. However, the corresponding table at this site is the older 1931 version. In 1988 C.I.E. updated the Photopic Luminous Efficiency Function because the 1931 function did not sufficiently weight the higher blue response of young people. Notice that 555nm is the reference wavelength of maximum human response. Hence a red laser of 650nm at 0.107 would appear 8.3x less bright than a 532nm green laser of similar power, and my 405nm laser would appear some 87x less bright (using an extrapolated response figure) than an equivalent green laser! But the violet Laser doesn't really seem that dim..? If one has played around with such a (violet) laser, one would have noticed that (1) You can see the beam in the dark and (2) The laser spot looks bright for its wavelength. Why? 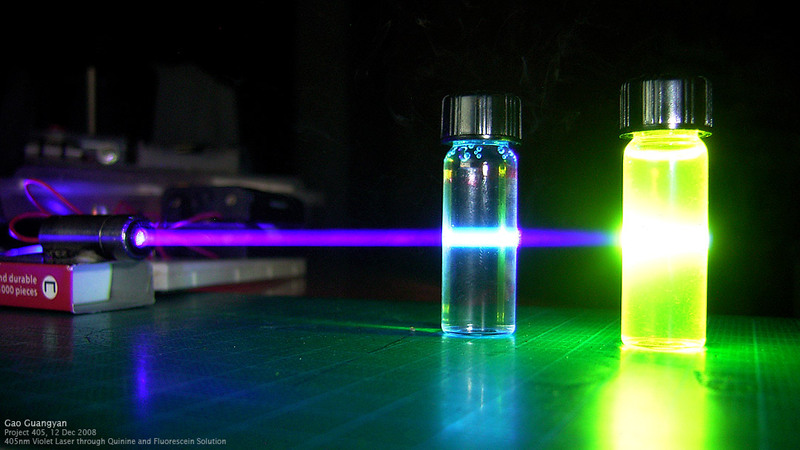 The reason why such a [relatively] low powered violet laser produces a visible beam is due to Rayleigh Scattering, where the air molecules scatter the violet beam around (same reason why the sky is blue). In fact, you'd notice that violet beams have a characteristic 'misty' beam appearance due to precisely this reason. 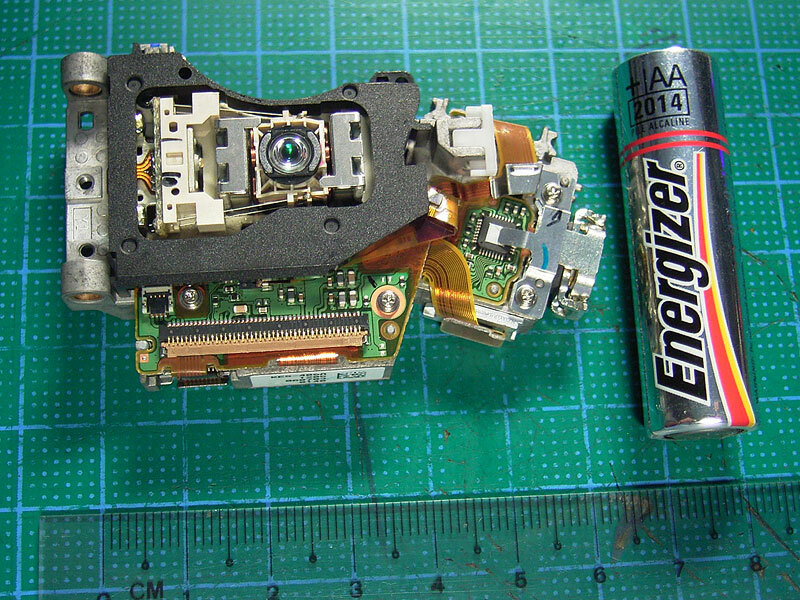 Here is a photograph of the actual laser diode assembly, part number KES 400A; laser diode assembly from a Sony PlayStation 3, size compared to a AA battery. The rubber mat surface is has 1cm grids..
After a quick inspection, it is immediately clear where the violet laser diode is (white arrow). 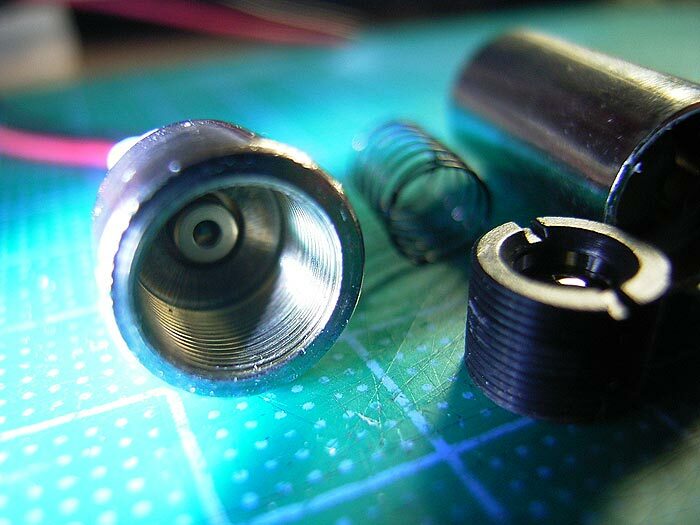 The actual laser diode can actually contacts 3 different laser diodes - a 780nm IR, a 650nm red laser and the 405nm violet laser we're interested in. They are connected together inside a Common Cathode Can configuration, along with a photodiode. 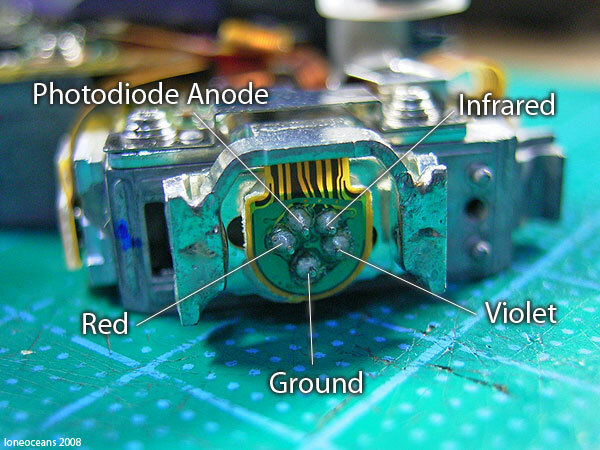 Above shows the pinout of this laser diode, which doesn't seem so weird now that we have established that each different pin corresponds to a different diode. 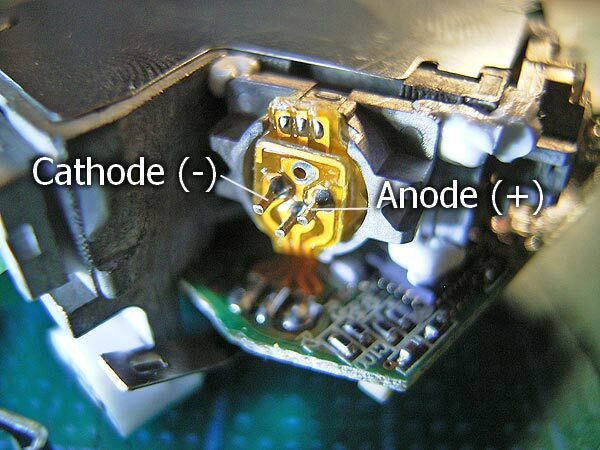 The case of the diode is also connected to ground. 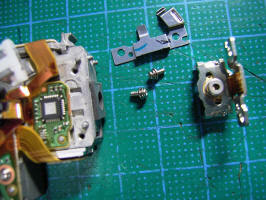 To remove the diode, I first unscrewed two little screws holding the laser diode assembly in place. But the assembly still seems stuck to the rest because it is connected via a small ribbon cable to power it. 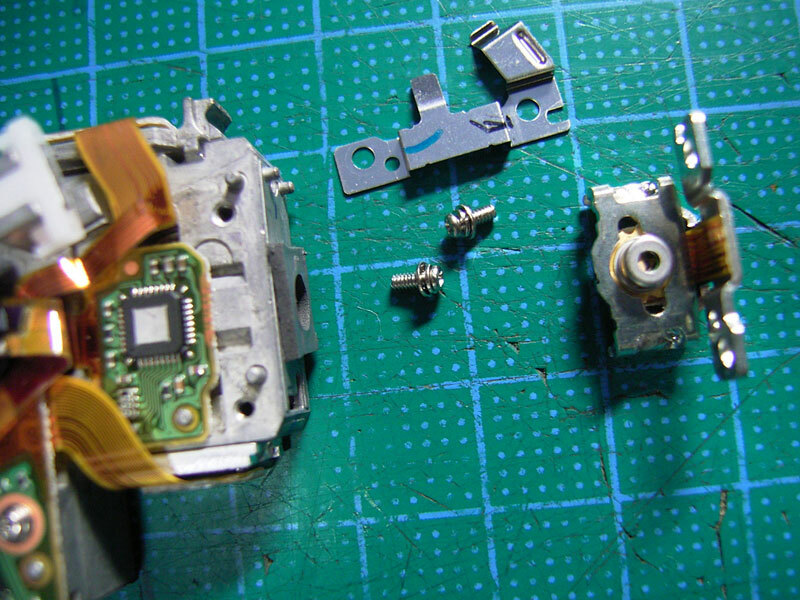 I used a sharp knife to cut it and the laser diode assembly comes off after a bit of shaking. The laser diode is still stuck on it's own little metal bracket, which holds it in place and also acts as a little bit of a heat-sink. But we can't use it yet unless we carefully extract it from it's housing. In order to remove the diode from it's bracket, I scrapped off a bit of the thermal paste surrounding it and balanced it between two coins. 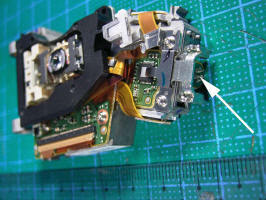 If you look carefully at the front of the assembly, there are two slots beside the diode can. Using a small screw-driver, I carefully knocked it and got the diode out. Here is the actual laser diode can, complete with the little bit of PCB and the ribbon cable which we have to remove. 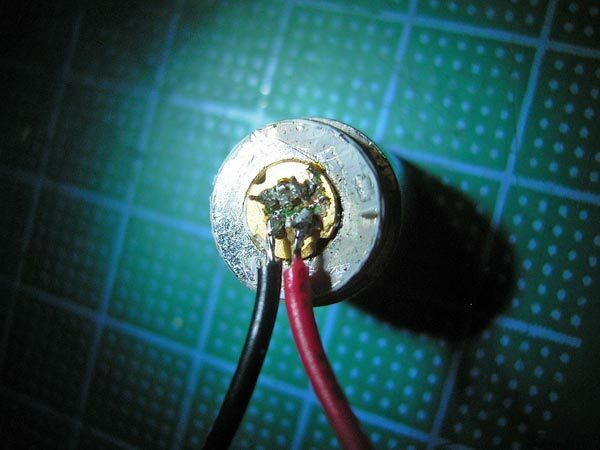 Extraction of laser diode - successful! 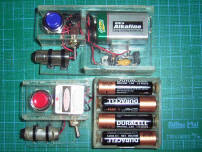 I'm using the common LM317 regulator as a current regulator, in a TO220 package. After some random experimentation, I found an adjusting resistance of 32.4 Ohms to be a good value, limiting the current to 38.6mA. 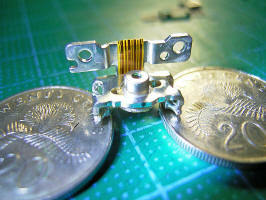 This adjustment is done using a 15Ohm resistor with a 100Ohm variable resistor. Any higher and I risk damaging the diode; any lower and the output becomes quite dim. I had initally planned to use rechargeable 1.2V NiMHs as the power source, hence I used a 6-battery battery holder (since the diode requires 4.5-5.5V for operation). 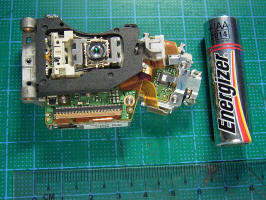 Alternatively, a 9V battery can be used, at the expense of a shorter battery lifetime (but much more compact). 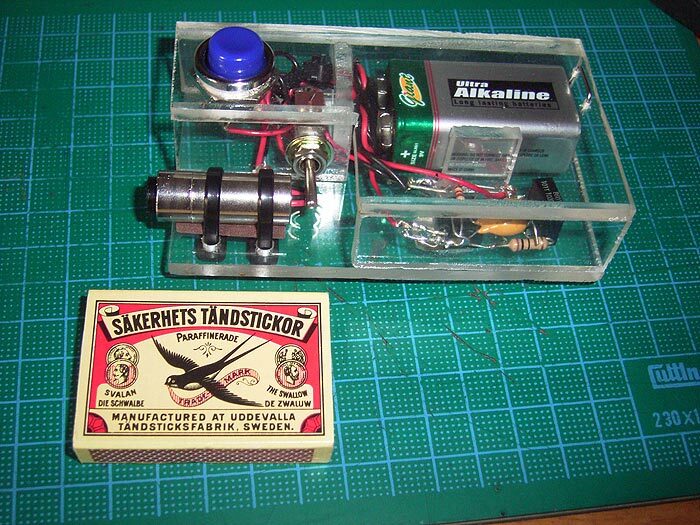 Below shows the initial setup using 6 AA batteries. 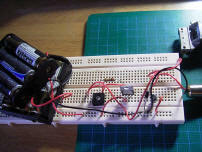 Before soldering the circuit together, the components were assembled on a breadboard and tested. 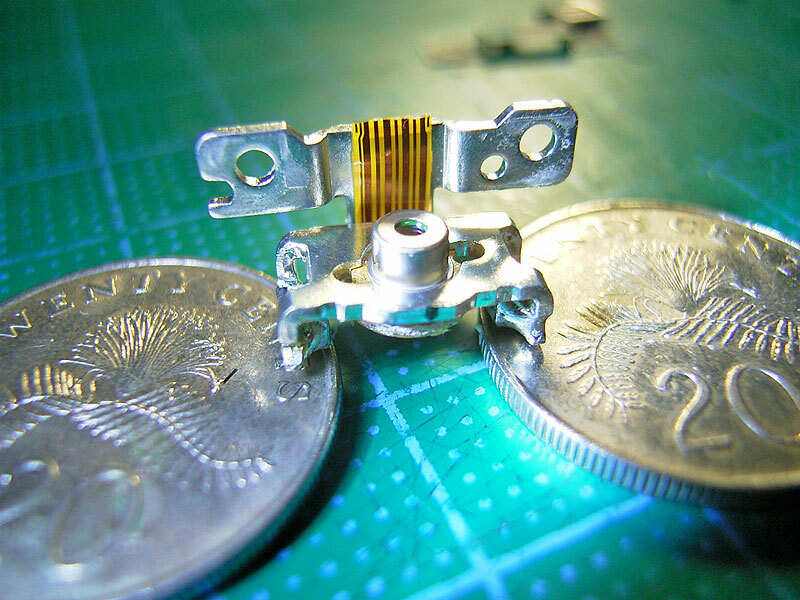 The resistance of the 100Ohm variable resistance was carefully tuned to ensure that I didn't overdrive and fry the laser diode. 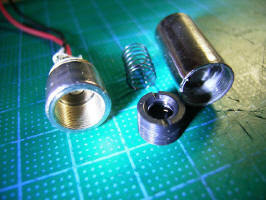 In the above photograph, the laser diode has already been assembled inside its casing. 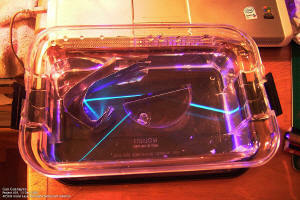 Read the following section for more details about the laser casing. Once I was sure that everyone was done (it is a rather simple circuit anyway) correctly, I hooked up the laser and was greeting with a lovely violet laser beam! Excellent. - When in doubt, do not try. Find out first! So just around New Year's Day 2009, I received my package of 3 PHR803t laser diode sleds (group buy) from the X-Box (as mentioned above), along with another sled from a 20x DVD burner (for a subsequent project). There you see the laser sled and part number sticker. 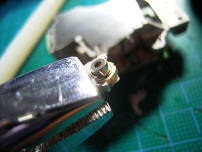 First up was to remove the metal bracket covering the diodes. This is easily done by unscrewing it. 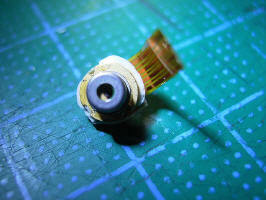 You should be able to see two separate diodes; one with 3 pins and another with 4. The one with 4 is the IR/Red diode and the one with 3 is the nice violet diode, which is the one we're interested in! By then I had completed my driver (see below for driver details) and did a quick test to determine if it was indeed the right sled. A flash of lovely violet spilled out all over my desktop! Note the little vial of sodium fluorescein. 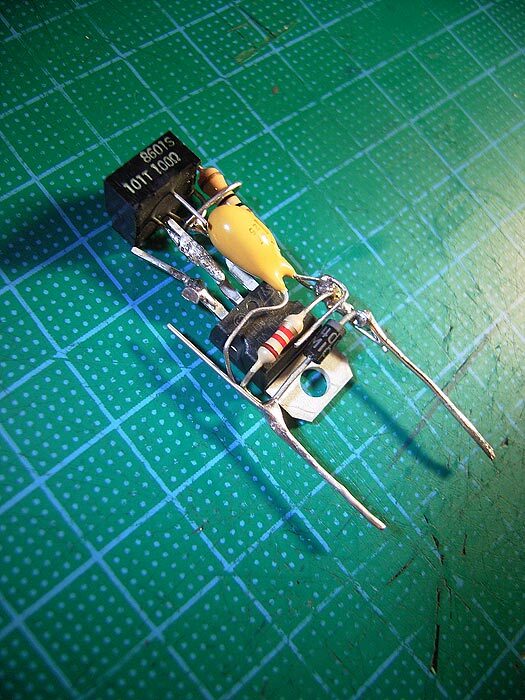 Close up of the diode with labeled pinouts. 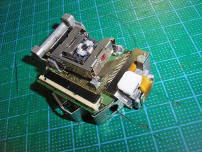 Notice that it's seated in it's own little metal heat-sink, which is in turn glued onto the main assembly. 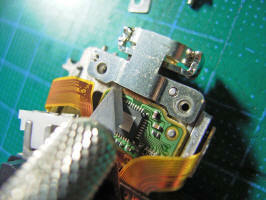 Extraction was easy; the first step was to chip away the glue holding the diode bracket to the main assembly. Once that was out, a little twist using two pliers easily snapped the diode bracket into to and allowed for easy removal of the diode. 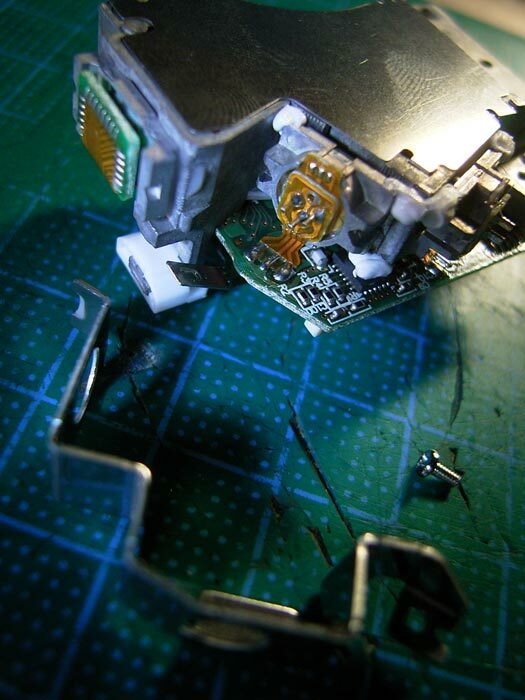 I decided not to remove the little PCB attached to the diode to avoid risking burning it out with my soldering iron. 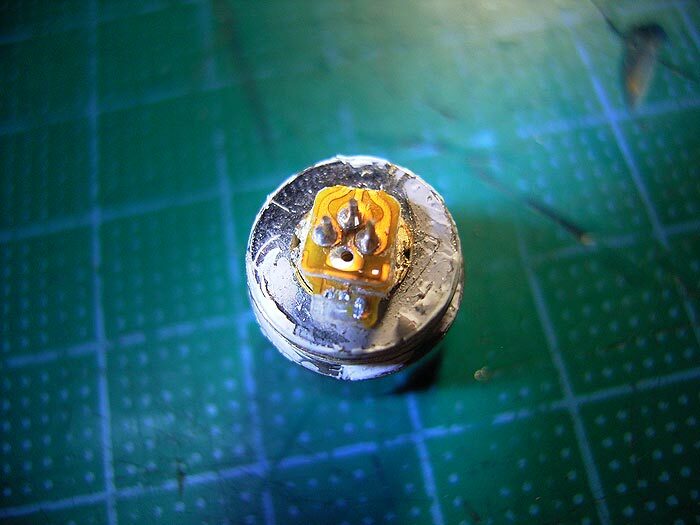 Like the KES400A, the next step was then to hammer it into the Aixiz housing (using a small screwdriver and a small hammer), then carefully soldering output wires from the diode. Extraction completed successfully! After a bit of tinkering, I settled for a improved driver circuit. It's essentially the same as the previous one, except for the inclusion of 3 additional components. The LM317 provides the current regulation. Power output is set to 1.24/13.1Ohm = ~95.4mA to the PHR803t diode. The 47uF 25V tantalum capacitor absorbs any residual battery voltage spikes; the 1.2k resistor drains away the capacitor charge when power is turned off, and the 1N4002 diode protects the laser diode from back currents. 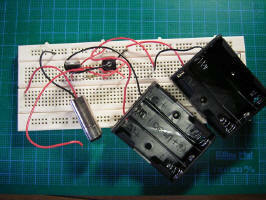 The circuit is powered by a single 9V battery. 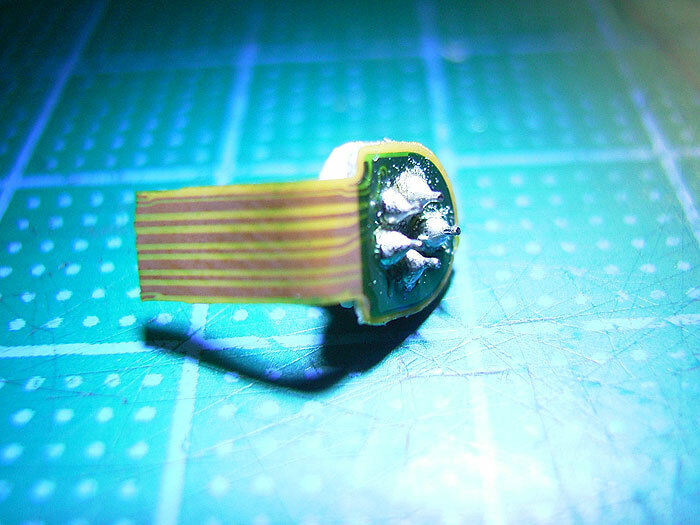 Of course the 1.2k resistor eats some current away (~3mA) so the total power to the diode is just over 90mA. This should give me around 60 - 90mW output of consistent and reliable laser light. 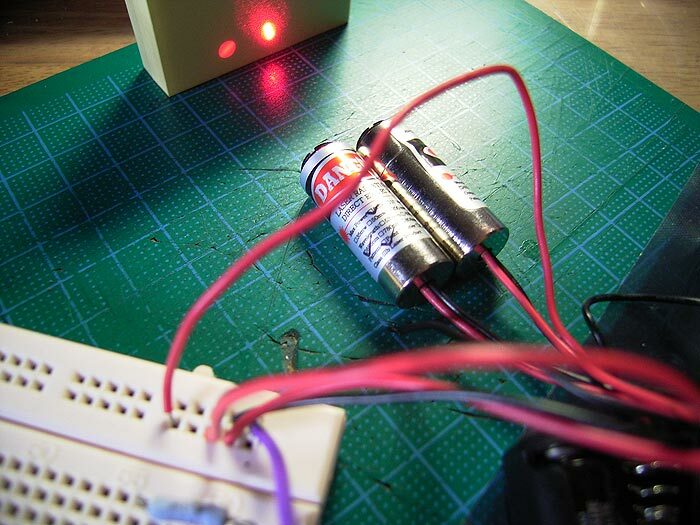 After testing out the circuit on a breadboard, the components were carefully soldered together as a single complete package without the need for a PCB. Design and construction took half an afternoon on the 3rd Jan 2009. Due to the characteristics of the laser diode's emitting junction, the emitted laser beam is wedge-shaped and very divergent. In fact, divergence of the X and Y beams are unequal and the focal lengths required to collimate the beam differs slightly. The general emitted beam shape will appear elliptical/asymmetric, and generally linearly polarized. In any case, given a beam divergence of 10 to 30 degrees from the laser diode can, external optics are required to collimate it. In order to save the trouble of finding a suitable lens and enclosure, I purchased a 650nm 12x30mm + case for $4.50USD from Aixiz Lasers (http://mfgcn.com/_wsn/page2.html). Perfect for my purpose and not overly expensive either. 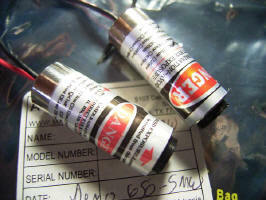 Above are the original 650nm red laser diodes. (Referring to the second photo), the right most laser being the 10mW one and the left most the 5mw one. Notice the difference in beam output (they're both under-driven though). 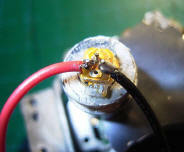 Nonetheless, I had to sacrifice the red laser diode to make way for the new violet diode! 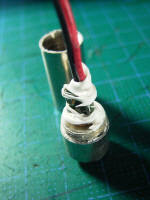 Managed to pry out the red diode without damage to the diode AND the casing! 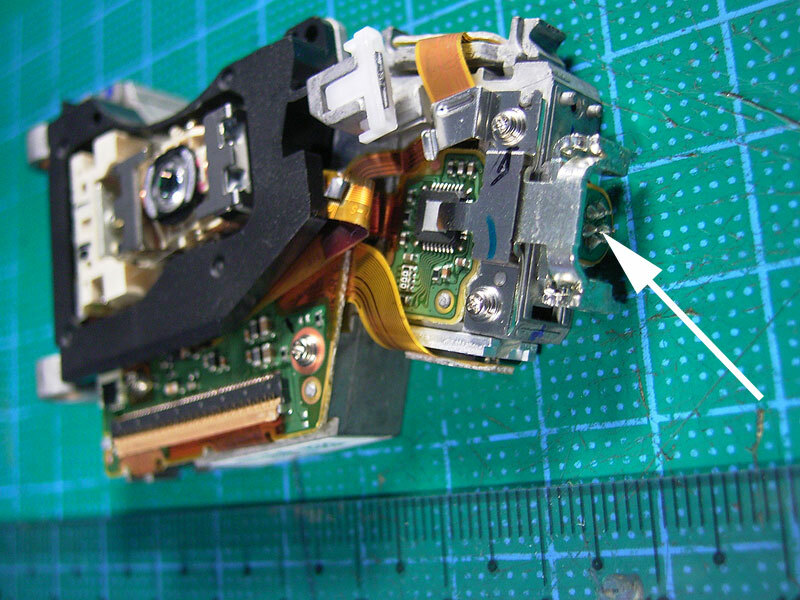 Note the small driver circuit attached to the red laser diode. Yes it still works perfectly fine and well! Brilliant! Back in 2006, I constructed my red laser enclosure completely out of clear acrylic. Unable to find a more appropriate host, I resorted to the same tried and tested acrylic method and built a completely new enclosure for the violet laser. 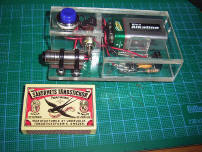 This took a complete afternoon of 3rd Jan 2009 (including design and assembly of the driver). Note the overall design compared with the red laser. It's more compact and more sturdy, and does with it's supposed to do well. Features include: One momentary push button, one pole switch, and a stainless-steel wire battery catch. :) Violet Laser Complete! Immediately after assembling the KES400A laser into the collimator, I tested it out with some excellent results. 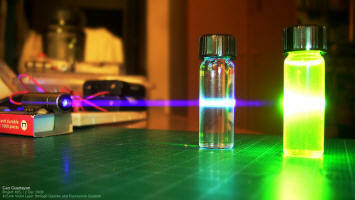 Here is the laser aimed at two glass vials containing a Quinine solution and a Sodium Fluorescein solution. Quinine has two main excitation wavelengths of ~250 and 350nm, with an emission wavelength of aqua blue 450nm; Fluorescein has an absorption maximum at 494nm and a strong emission of green 521nm in water. The quinine solution is none other than 'Tonic Water', available at all supermarkets and also commonly sold as 'bitter lemon'. Read here for more information. The violet laser doesn't appear that bright nor bluish as seen in the photograph though. In reality, it's a much deeper purple, more similar to commercial black-lights. A nicer photograph with background lighting. 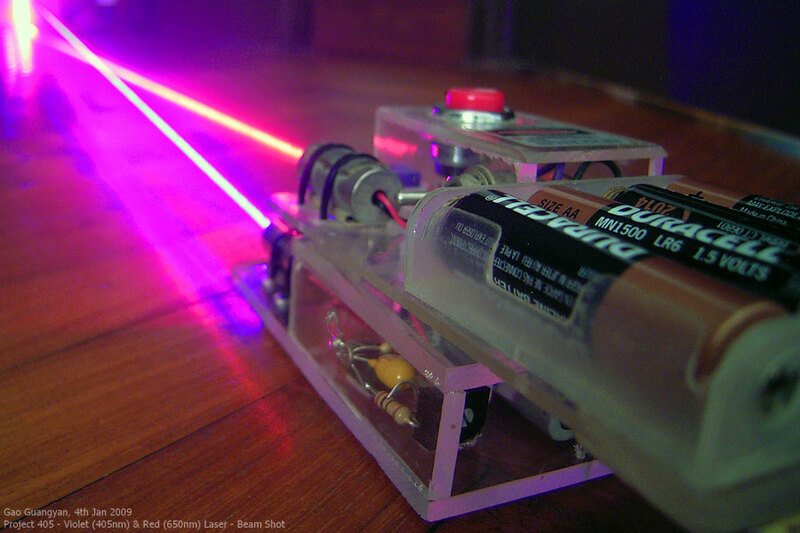 Notice the driving circuit behind the laser, which is sitting atop a stapler box. 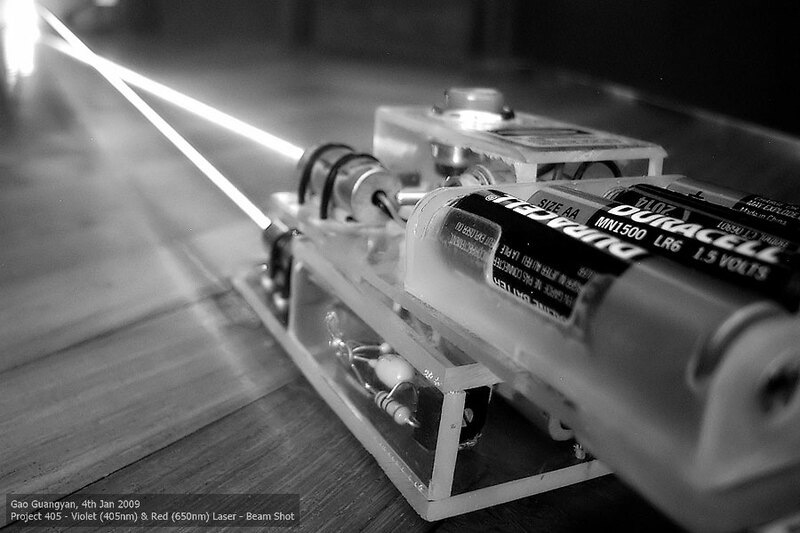 Unfortunately, you cannot 'see' the beam since this laser is quite low powered. The photographs were taken with a bit of smoke created using a burning match. More photographs to come! Unfortunately I do not have a fog machine to make nice beams, nor do I have much optical accessories like mirrors or prisms, so we'll just make do with the above laser playground for now. It's just a clear box containing fluorescent water (water with some highlighter ink dipped in), some aluminium foil as 'mirrors' and one glass semi-circle block (which is about the only optical accessory I have). Laser is shining from the bottom right. Enjoy! I do not have any equipment to measure the output of the laser at the moment. Initial results of both the red and violet laser in action. 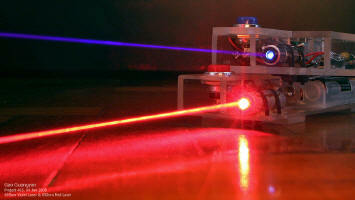 A Better and more realistic photograph of both lasers in action. The output of the violet laser is visible cleaner (much less speckle). While the violet laser itself is not very powerful, it appears extremely bright especially on white paper (which fluoresces a very bright blue), and outshines even the more powerful red laser. More photographs to come! The cool thing about the internet is its connectivity - manifesting itself in the form of hyperlinks! Here are some nice and very useful webpages which helped me in Project 405.